Ideal for exercise and relaxation for individuals and families, the Bender JCC boasts two large pools (indoor and outdoor), a children’s wading pool and water play space, and comprehensive swim classes, clubs, and clinics for all ages, abilities, and skill levels. Our fabulous new outdoor pool! 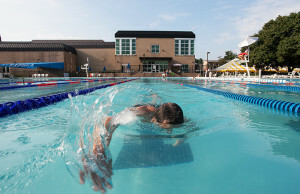 The Bender JCC of Greater Washington offers swim classes, swim lessons, and swim clubs for all ages and skill levels. Learn to swim, refine your strokes, or build endurance—it’s all possible at the Bender JCC. Our Water Babies and Water Tots classes introduce children with their parents in the pool to the water. Using verbal cues and body language your child will be introduced to basic swim skills including back float, kicking, blowing bubbles and reaching all with assistance from the parent. Ages 6 months to 3 years. Our swim classes introduce children of all ages to the water, helps new swimmers become adjusted and teaches fundamental swim skills and strokes. Our youth and adult swim clubs allow swimmers to work on competitive skills and build endurance through challenging workouts and individual stroke correction. Private (one student per instructor), semi-private (two students per instructor) are available in 30-minute increments. Lessons are based on instructor availability and are available to Bender JCC members only. To schedule lessons or for more information, contact Caroline Cardullo at 301-348-3890 or ccardullo@benderjccgw.org. Free to members, the Bender JCC’s aquatic group fitness classes—including Aqua Zumba, Flex & Stretch and Aerobics —are low-impact total body workouts ideal for all ages. 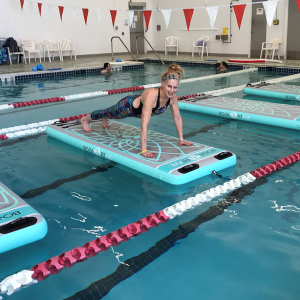 See our list of classes HERE or for more information on aquatic group fitness, contact Rachel Ossman at rossman@benderjccgw.org or 301-348-3891. 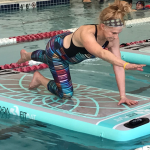 BogaFit is a workout geared to heighten your sense of balance while building your entire core, cardiovascular stamina, and total body strength. The Bender JCC offers swim classes for children, teens, and adults with physical disabilities. Learn more about the Isadore & Bertha Gudelsky Exceptional Swim Program. The Bender JCC is committed to keeping its members and visitors safe. In addition to our certified lifeguards, we require strict adherence to our pool rules. 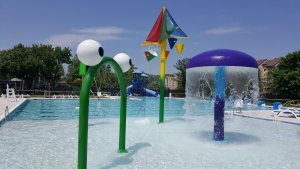 Learn about our outdoor pool rules. Questions about aquatics at the Bender JCC? Contact us! ProAction Physical Therapy offers Aquatic Therapy water for people who do not tolerate treatment ‘on land’. We are one of only a few clinics in the Washington, DC area that offers this valuable service. Our Physical Therapists are expertly trained to provide therapy in the water. Take advantage of this exceptional program right here at the JCC! Creates a safe and effective environment to exercise. Enablespain-freee strengthing, stretching, and overall mobility. Uses hydrostatic pressure to reduce swelling. Improves your ability to balance. Creates the ability to move joints through greater ranges of motion. Aquatic Physical Therapy is covered by Medicare and most medical insurance plans when it is prescribed by a physician. 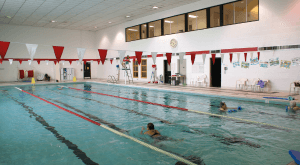 There is no extra cost for participating in Aquatic Therapy sessions. Please call us for additional information at 301-881-CARE (301-881-2273). See you at the pool!